I sat through most of my years of schooling watching the clock, waiting for the period to end. I did well in school, but the times where I was excited about my learning and was truly engaged, were relatively few. What about you? What do you remember? I remember the rare occasions when the whole class entered into some meaty discussion and where opinions and ideas flew from all directions. I recall the freedom of the moment, when what we thought, mattered. How invigorating it was to come out of a conversation where I felt like something had been discovered and where I was more enlightened to truth. When I decided to homeschool my children, I knew that these were the type of moments that I wanted to be the norm, not the rare occasion. Looking for a way to let loose the sails of learning and explore ideas in your homeschool. 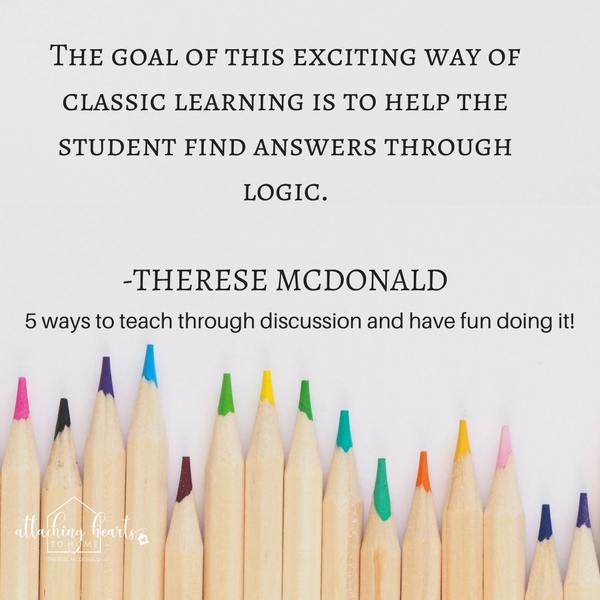 Discover how to recover joy with 5 ways to teach through discussion and have fun doing it! The traditional model for learning I grew up with was via lecture. This pattern meant that the teacher did most of the instructing and talking and the students listened, maybe took notes, and were allowed to ask clarifying questions along the way. There was an assumption that the teacher was always right and that information was imparted. Students proved they knew and understood the material by doing well on a test. There was typically one correct answer to each test question. Well, I decided to dump the lecture method quite early on in my journey as a homeschooling parent. My children were encouraged to use their reasoning, express their thoughts and opinions, while I presented a structure for them to discuss together. This classic way is based on the classical Greek philosopher, Socrates. In a cooperative way, our family would work through a few questions, seeking further understanding, truth, goodness and beauty. 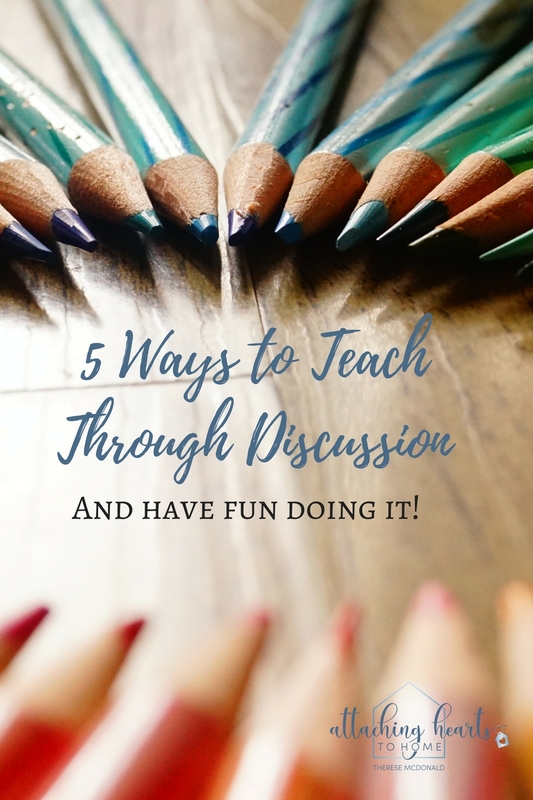 Here are five ways to teach through discussion and have fun! 1. The parent prepares a few open ended and meaningful questions. Avoid dead-end queries; those that are answered by a yes or no. Instead, strive for something that will take your children deeper. 2. The parent keeps the discussion focused by having a goal in mind. Let there be sufficient freedom to explore thoughts and ideas but keep to a goal of searching out a key truth and answer. Today I want the children to consider the idea that we can become stuck in life if we are waiting for someone to rescue us or direct us. I will use the Winnie-the-Pooh story we read aloud as a basis for our discussion. 4. The parent encourages respectful challenging of ideas. The classic process encourages cooperative disagreement. At this point the parent continues to ask good questions that bring forth clarification and consensus. 5. The parent points out the strong elements and conclusions reached through the discussion. I guarantee you that learning through reading and discussion allows education to flourish and much ground is covered by visiting many meaningful topics and life questions.